Hello people from Alaska! Hey guys! I would love to visit Alaska some day.Looks very pretty!I'd love to see the montains and lakes! 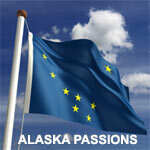 Help us keep Alaska Passions free of spam and fake profiles.